We are privileged to complete numerous store refurbishment projects throughout the country for Superdrug stores that are part of the A S Watson group. The management team at A S Watson provide us with regular and excellent feedback regarding our performance, in particular, how we perform in terms of health and safety on site. Engaging a specialist third party Health & Safety Company – Eurosafe, unannounced audits are completed on projects throughout the country. 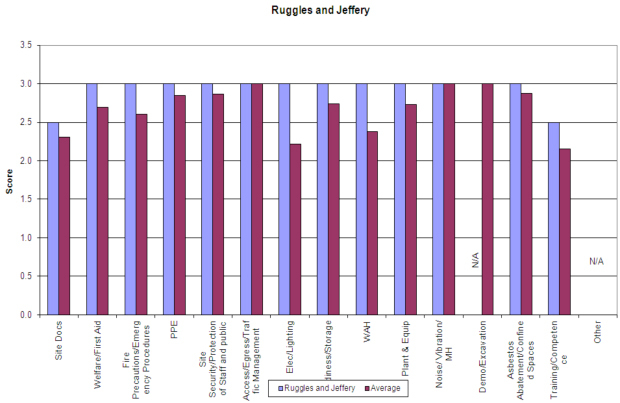 Quarter Two 2013 saw Ruggles & Jeffery top the league of fifteen national contractors involved in the national refurbishment roll out with Ruggles & Jeffery achieving an average score of 98%. The bar chart below highlights the areas audited and how we fared against the national average in each category.